The Maricopa High School DECA Club hosted their second annual Maricopa Shark Tank on Thursday. The competition was opened to students from the sixth grade and up, and hundreds of eager inventors showed up in force. The big winner of the night came from Maricopa High School. 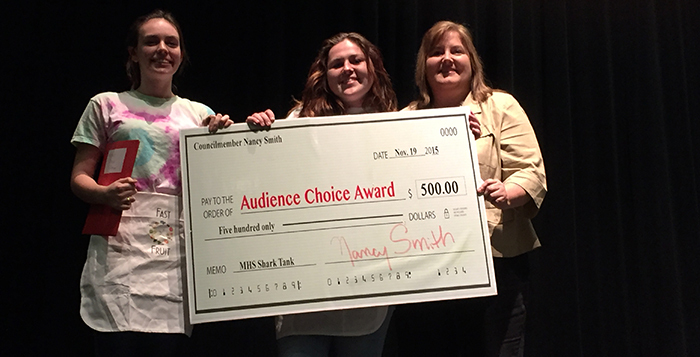 Juniors Alyssa Hollingsworth and Lillian Chitwood were awarded the $500 audience-voted grand prize to get their healthy fast food alternative off the ground. Fast Fruit was also awarded $100 from “Shark” Mike Richey of Maricopa’s ACE hardware to help get their business off the ground. Fellow “Shark” Holley Trafalet of Trafalet Accounting also invested in Fast Fruit and offered her accounting services to help the duo get set up with their develop a business plan and get set up with their business license. “I think our first step is getting our business license so we can make everything happen,” Chitwood said. Fast Fruit is expected to make its public debut at the annual Salsa Festival in March. The biggest surprise of the event came when 12-year-old Desert Wind Middle School student Logen Thomas and his company “Sweet Nes” made the top five to present to the “Sharks.” Logen came up with the idea to put sugar inside the tea bags so people could have sweetened tea without having to spend as much money on sugar. However, it was Thomas’ personality more than his business idea that won over the crowd. When Logen first took the stage, his nerves seemed to get the best of him. After composing himself with a few deep breathes, Logen presented to the judges with confidence and had the crowd consistently laughing with his witty answers to the judges’ questions. At the end of his presentation, he earned booming applause and, more importantly, an investor.